Adorable, Curious, Smart, Charming, Inquisitive, Playful, Affectionate, Goofy, Endearing, Cute, Fun & Definitely Not Camera Shy. Meet FullCircle George! 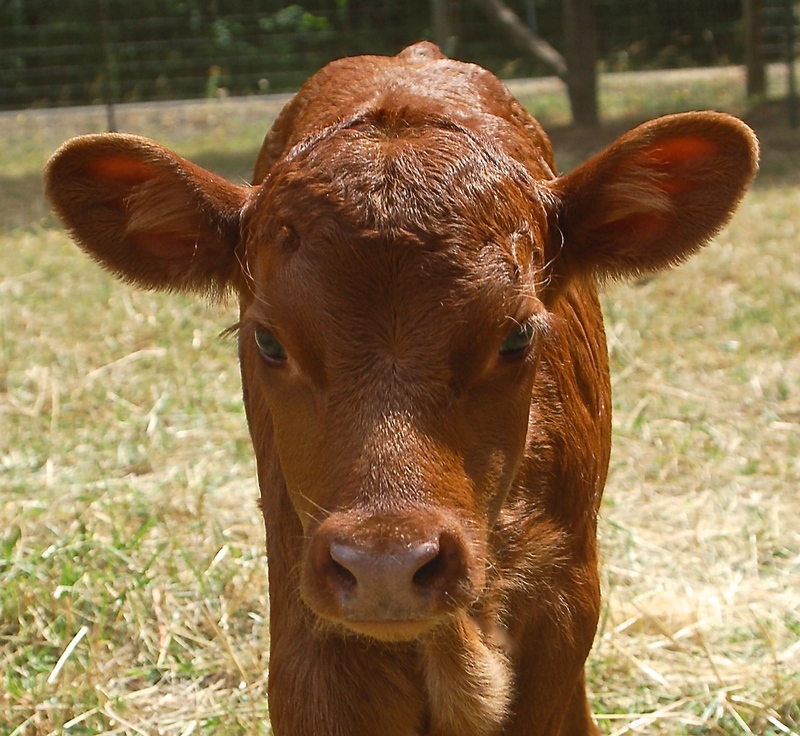 George is a polled, RED, Dexter bull calf. 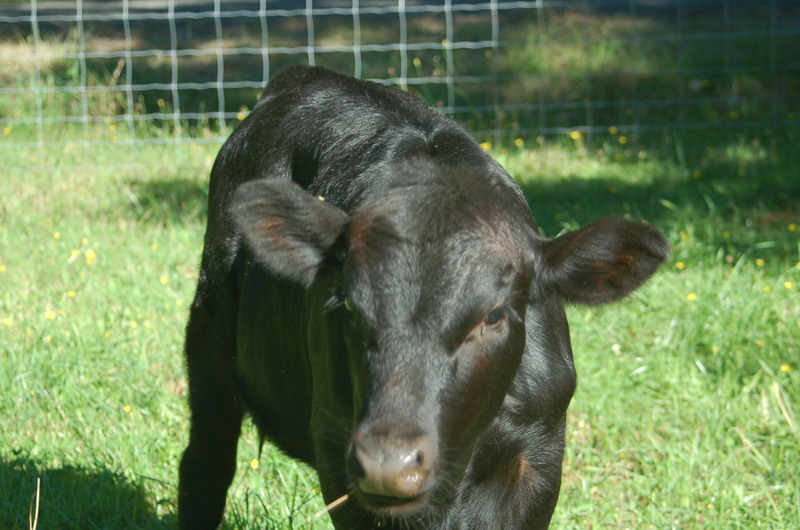 He was born on July 15th, 2015, the 2nd of 2 bull calves born on our farm this year. George is out of our beautiful polled, dun cow FullCircle Eloise and sired by the renowned polled, red Dexter bull Hillview Red Wing. 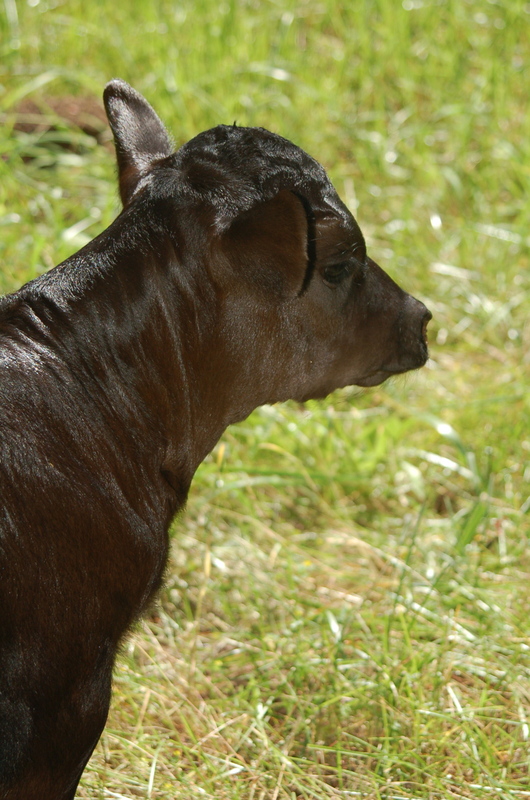 This little man may just be our first future bull prospect! what is that clicking sound? HI… my name is George! 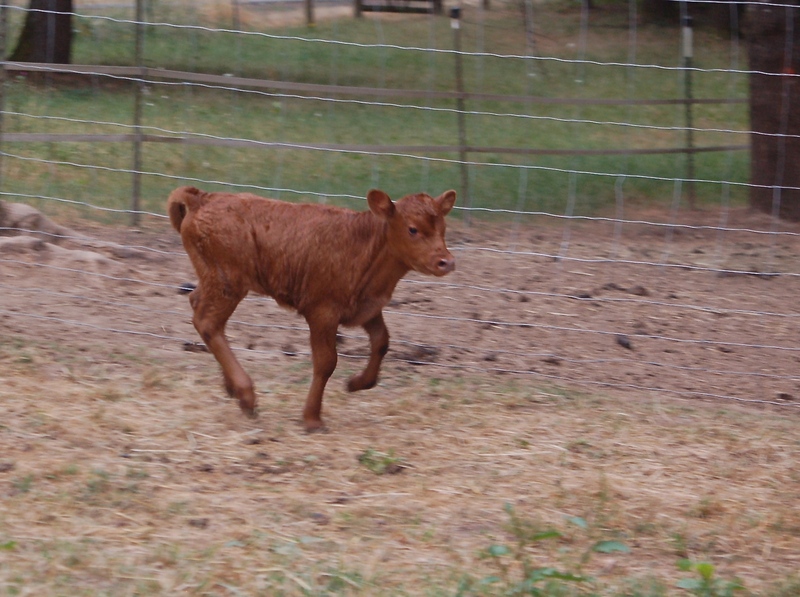 Dexter Calves are just plain FUN! On the night of May 28th, @ 10 pm to be precise, we were once again witness to the miracle of birth. 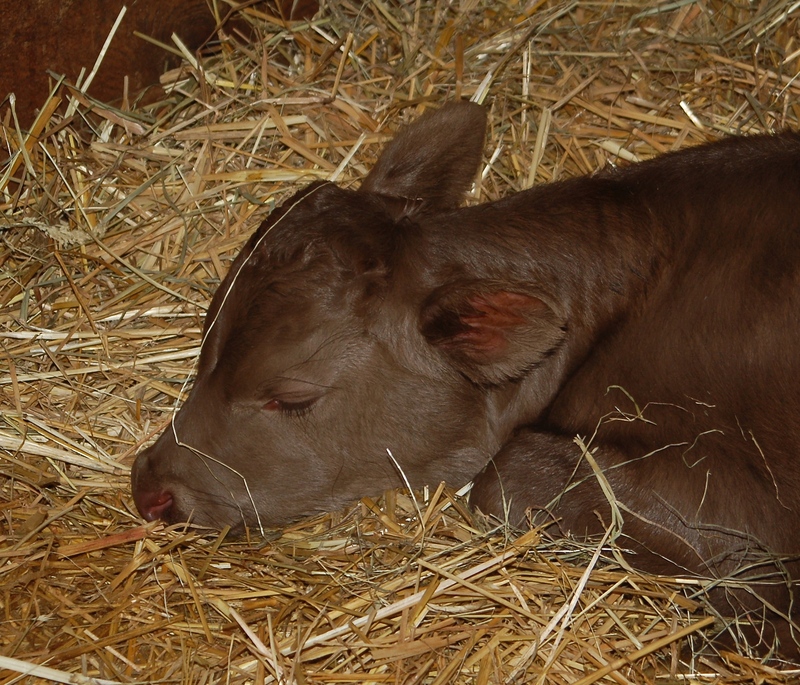 Our first Dexter calf of 2015 was born that night. 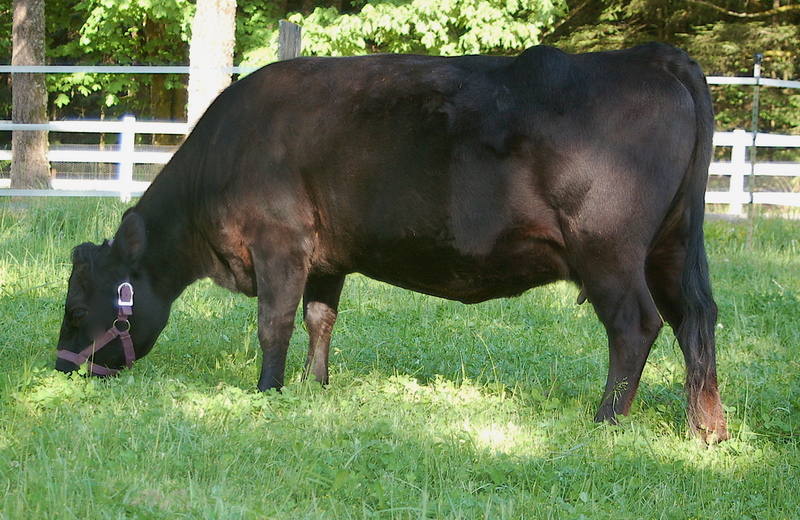 Our matriarch momma cow Belle Fourche Merrideth, @ the age of 11, was preparing to give birth to her 9th calf. Experienced. She began her labor, walking, circling, up and then down and then up again. Laboring, contractions, pushing. Contractions getting closer. Lying down, a giant push & the water broke. Up again, walking, circling, up and then down and then up again. Hoof toes appear, then 2 pale colored hooves, soles down… so good to see the correct position. Labor, contractions, pushing. A nose appeared, a pale colored nose & a tongue… so good to see. 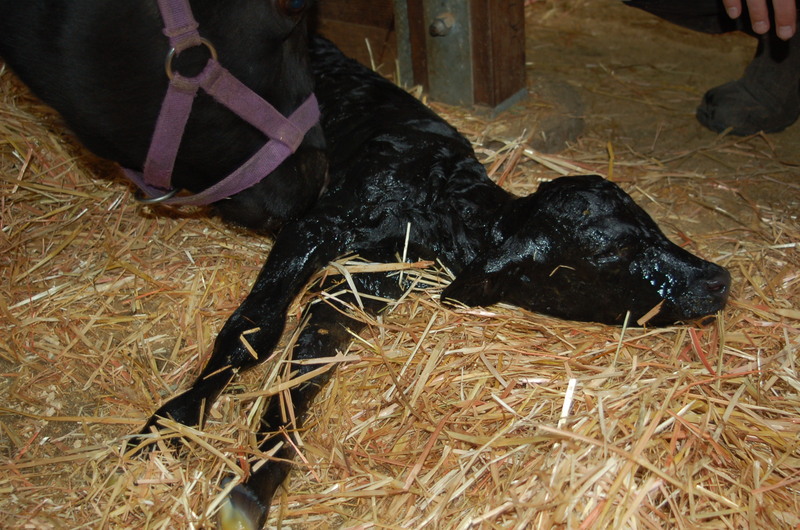 Quickly there was a head, then shoulders, then a warm wet calf dropped to the straw covered floor. 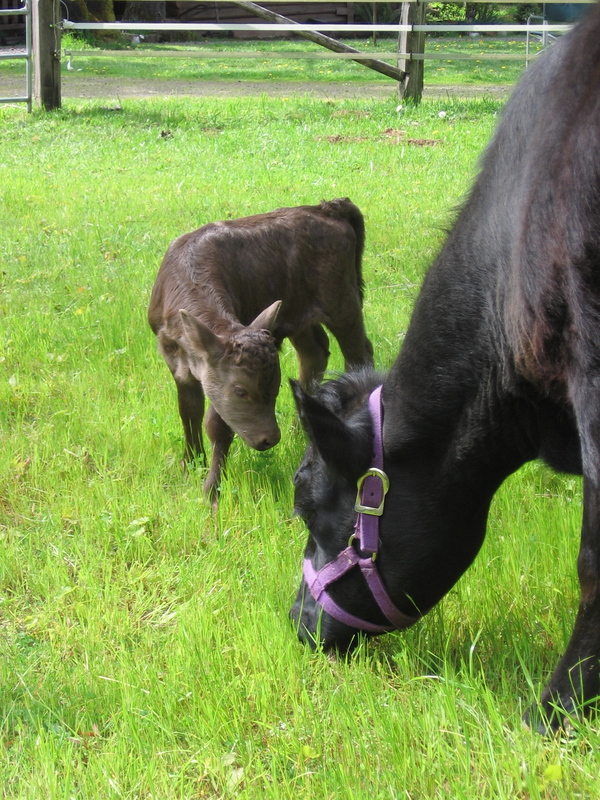 Merrideth spins around, nose to her new baby, licking with earnest. She begins her gentle low chorus of momma moos, encouraging. 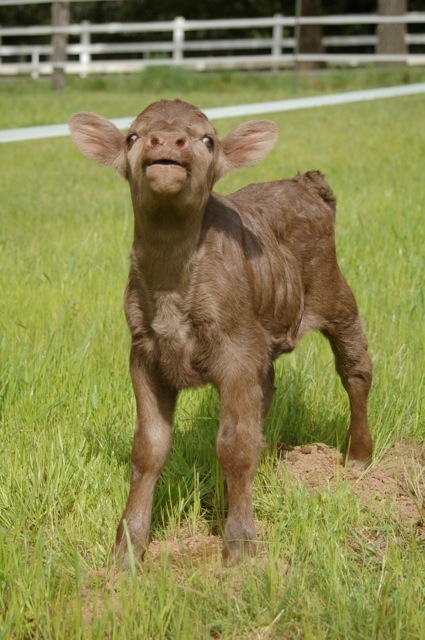 The calf shakes his head & snorts, eyes open, legs moving. 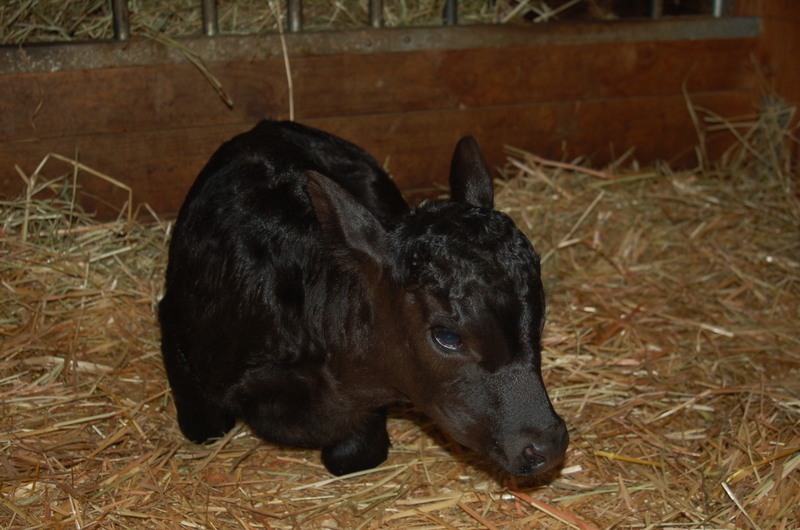 The little dun colored bull calf makes many attempts to rise. 10 minutes later, 4 wobbly legs under him, he stood for the first time. Standing, walking, circling, up and then down and then up again. 5 minutes later he found his momma’s udder, then the teat and then milk. Lovely, warm, powerfully nutritious, life giving, first milk. Mom licks and licks and licks until his beautiful silvery coat is clean & dry. Nap time. Happy Birthday FullCircle Walter. Welcome to our world. This is FullCircle Norman. Norman is a 5 month old Dexter bull calf on his way to becoming a steer. He is Dun in color and at 5 months stands 34” tall at the shoulder and tapes @ 300#’s. Norman has been a joy to raise. He is very handsome, smart, friendly, calm and gentle mixed up with a bit of the clown. The other day my husband Bob went out to their turnout at noon to feed the cattle family their hay lunch. Norman was lying down under the hay feeder chewing his cud. The hay was put into the hay rack above him and the other cattle began eating. Norman figured this was a really good gig he had going. He could lay down and the other cows would knock down the best hay for him to eat. Lunch was on the lounge that day! Since Norman is such a fan of National Public Radio, he listens every morning in the barn during morning chores, he has heard numerous stories about the importance of energy conservation. Norman is ALL about energy conservation and helps out whenever he can! 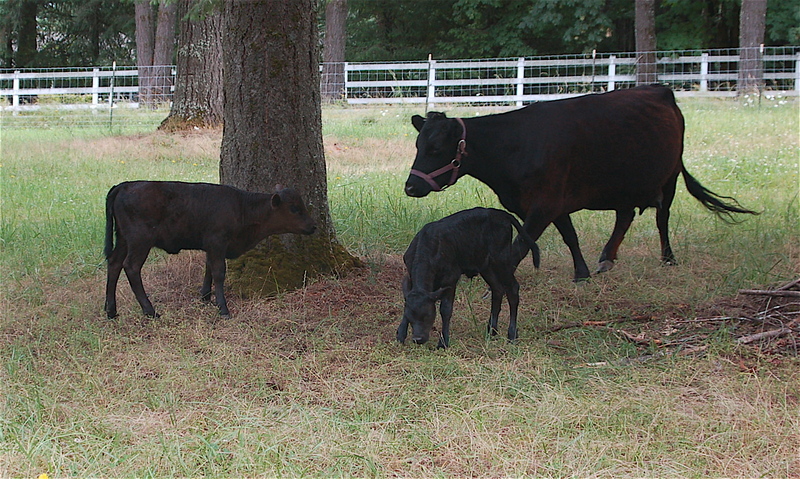 We raise Registered Dexter Cattle on our 18 acre farmstead in NW Oregon, USA. 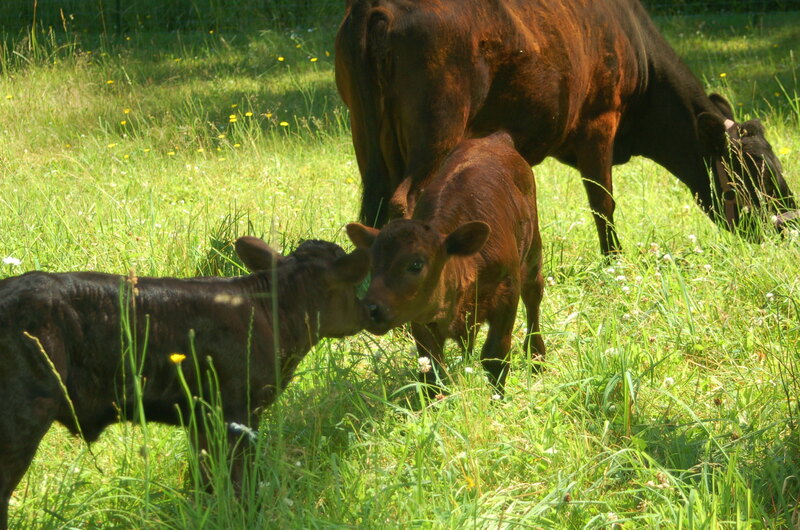 Our small family herd of Dexters spend their days outside on either pasture or in a large turnout area. They are brought into the barn each evening. Every morning begins with the cows. While I am doing barn chores and they begin breakfast, we all listen to NPR together. I have very educated cows that are up to date on the pressing issues of the day! Our farm routine also ends each day with the cows. Us humans always end up sitting on the edge of the cow mangers visiting and catching up on each others day. The cows contentedly munch on their dinner and are happy being the recipients of an ear rub here, a chin scratch there. It is a lovely way to slow down and end the day. 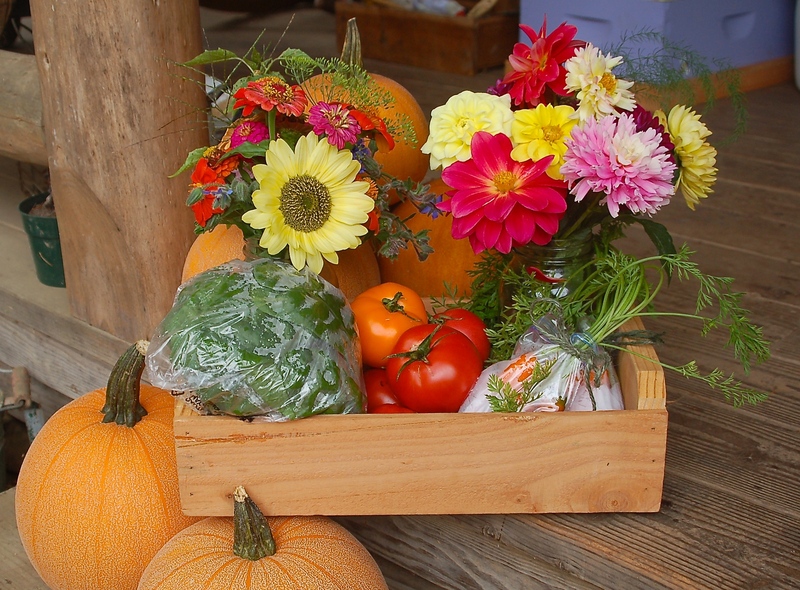 The Dexters have been a wonderful addition to our farm. They give us Beef, Dairy products, beautiful Calves, mowing and weed removal services and fertilization, but also hours of fun and a daily laugh at some antic or another! To enjoy other blog posts about our Dexters follow these links. 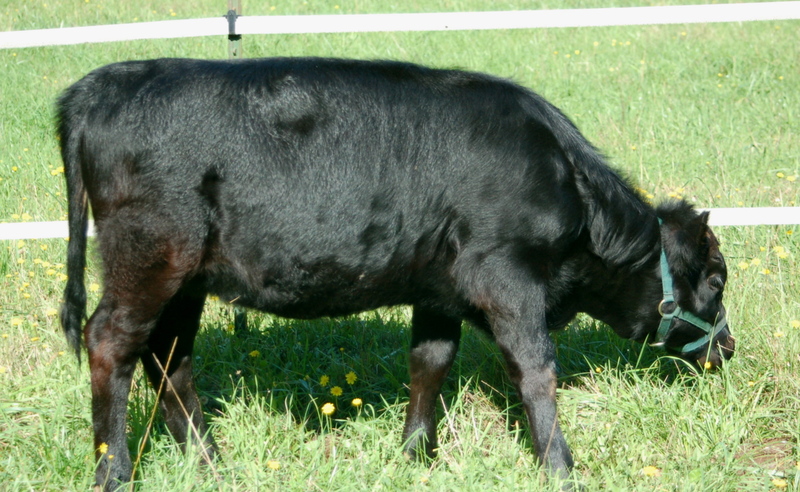 To read more about our cattle check out our Dexter Cattle page on our web site page ! 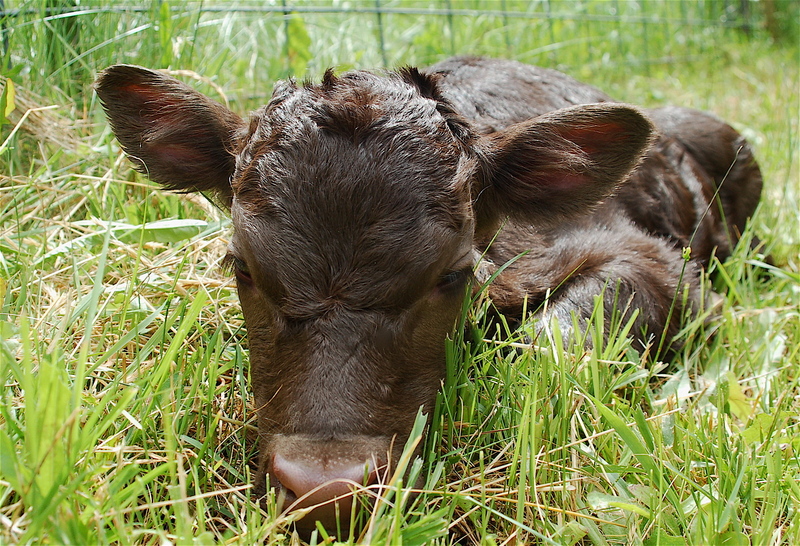 Our first calf of 2014 arrived on Sunday evening May 18th. 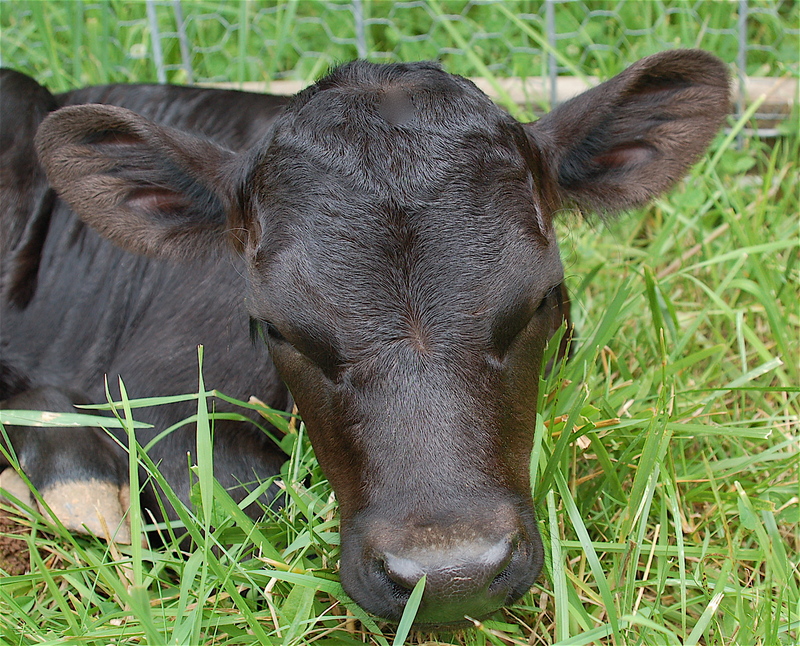 An absolutely adorable, polled, dun, Dexter bull. We have named him Norman. So cute that on his first day out on pasture he is already stopping traffic on the road! Mom- Merrideth, is a pro at this. She is 10 years old and this was her 8th successful pregnancy and birth. Merrideth is everything a good Dexter should be. She is a great little family cow. She was the cow we chose 5 years ago to start our Dexter herd. Merrideth had a bit of a rough start to life. 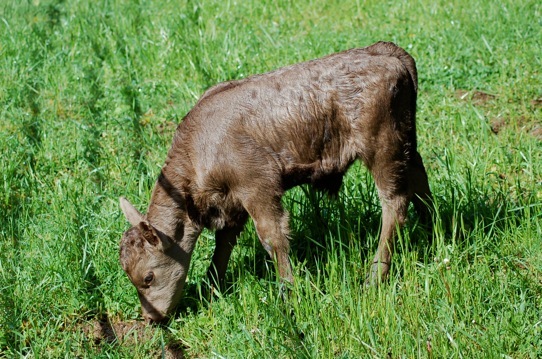 She was included in a sale of several other calves & at the tender age of 3 ½ months made a long trip to her new home in Washington state. Her new owners worked very hard to bring her back to good condition. 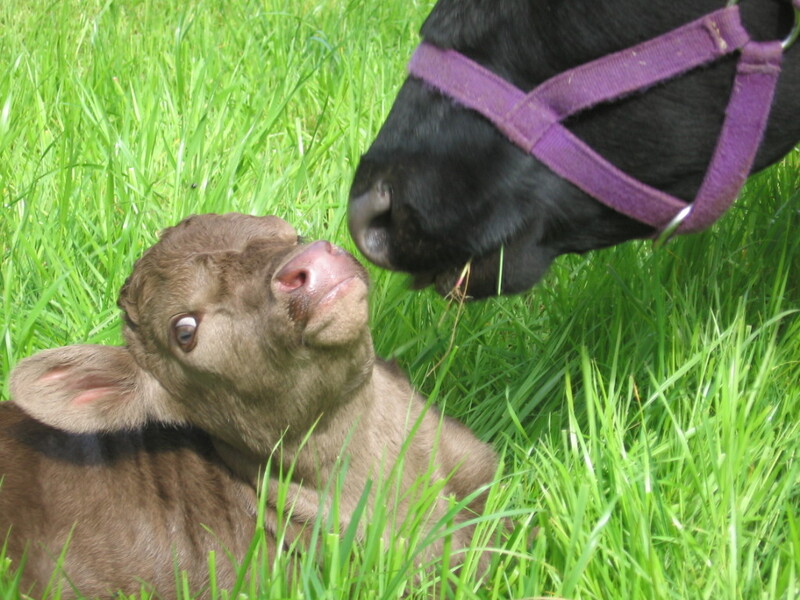 They loved on her and raised her to be a nice young cow. 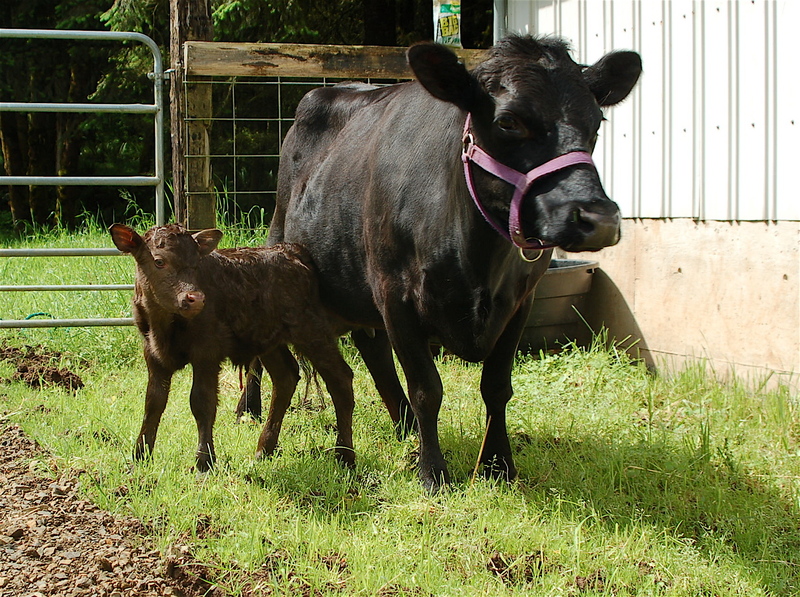 She had 2 heifer calves for them at their farm and then a lease gone wrong had brought her back to their farm where she delivered her 3rd calf several weeks later. They wanted a good home for her, she was special to them as she was there as they were starting their own Dexter breeding program. 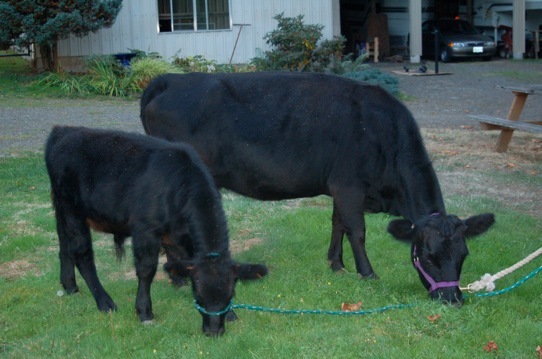 In August of 2009 we walked into their pasture to take a look at 3 different prospective cows, all with young calves. 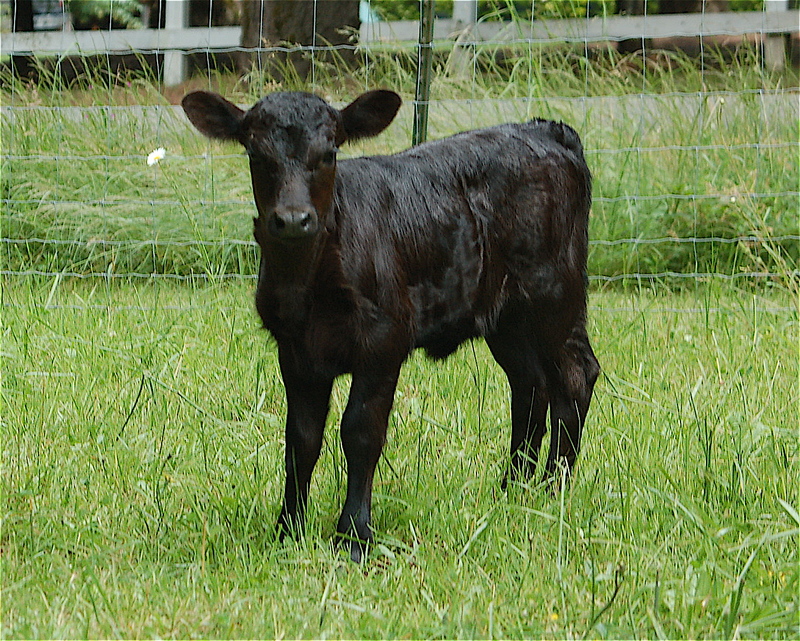 This small black cow with a gangly calf instantly caught my eye. There was something about her eyes. They were big, brown and beautiful but I loved how she looked right at us. She stood as we approached, was easily haltered and she spent the next hour, as we humans talked Dexters, not moving, only looking around to keep tabs on her calf & uttering little maternal moo’s. I was smitten. She wasn’t perfect, her udder was wonky, her feet not the best, her conformation OK but not show ring great. We were told “she herself wasn’t of the greatest quality but she had great breeding and she would pass that greatness on to her babies. Chose your bulls well and she will give you really nice calves”. I believed her and took her comment as sincere. That day we purchased our first Dexter. Merrideth definitely has an opinion and is strong willed. It did take a little while for us to figure each other out and to come to a mutual agreement of how this relationship would work. We soon realized that it was simply her way of asking for respect. When treated with kindness and shown respect she began to thrive. At the age of 10 she is beautiful, healthy, happy and showing no signs of slowing down. She has been a patient teacher to us as we learn about the world bovine. 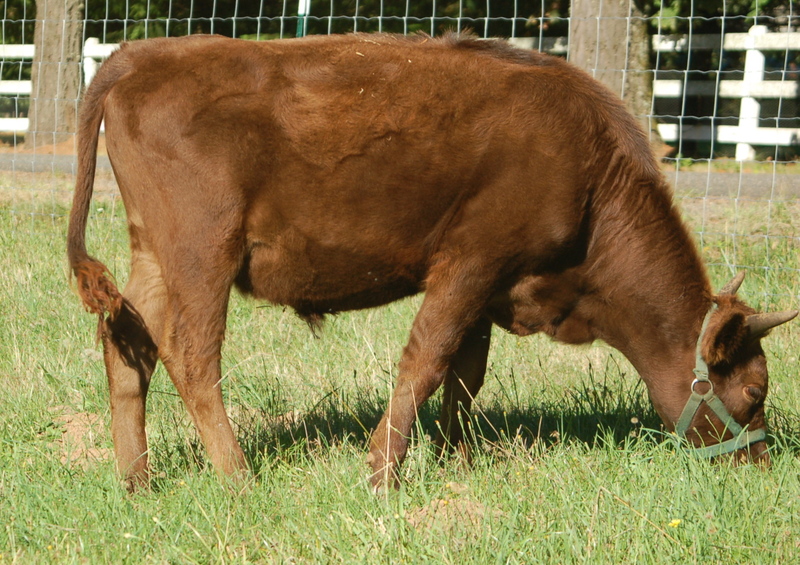 She is a wonderful Mom to her calves. Caring for but not hovering, allowing her kids to experience their world and grow into who they are. Keeping them safe but letting them go. You’ve got to respect that. Stefani was right, chose good bulls for her and she will give you beautiful calves. Merrideth has done just that. All 5 of her calves born here have been physically better than herself; more correct, nice udders, good feet. She has passed on the good genetics to them but also that something special, that something ‘Merrideth’. Dexter’s- A great little cow. 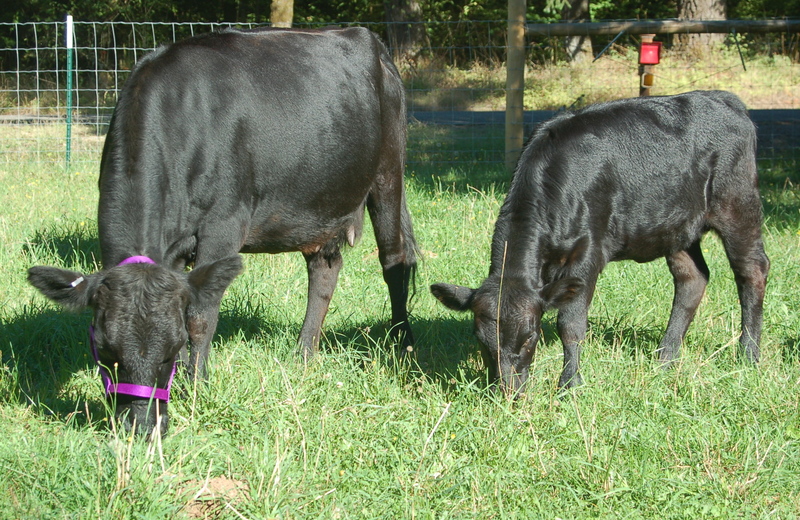 In 2009 I was doing research on breeds of cattle looking for one to add to our small farm. We ultimately chose the American Dexter. Originating in Ireland, this small stature, dual-purpose breed had all the characteristics that I was looking for. With mature cows weighing in around 700#’s and standing approximately 40” at the shoulder they seemed a perfect fit for us and our small farm. 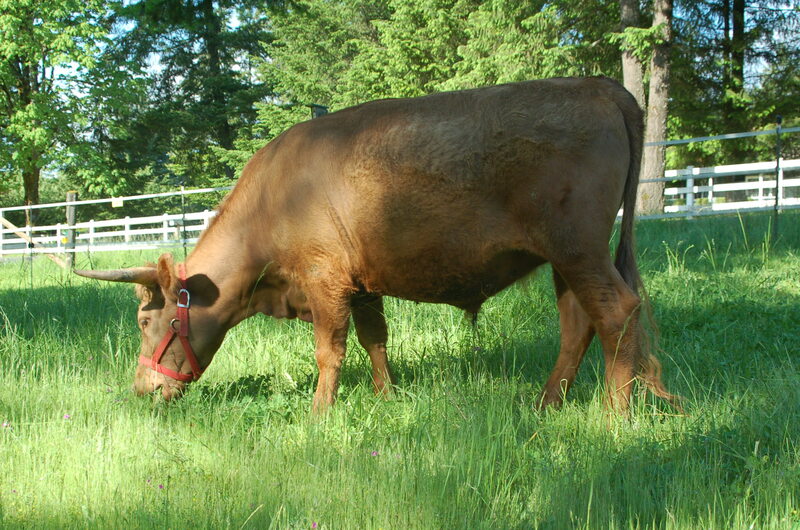 For a family cow a Dexter will produce a manageable quantity of high butterfat milk, 1-2 gallons per day is common. Our family milk needs are much less so I chose to milk once a day and only take what is needed in the kitchen. Sharing with the calf allows me access to wonderful milk as well as providing the calf with a great start in life. A Dexter for beef will produce about 400#’s of tender and lean, well marbled, dark red beef in smaller portion cuts from a 24 month old steer. 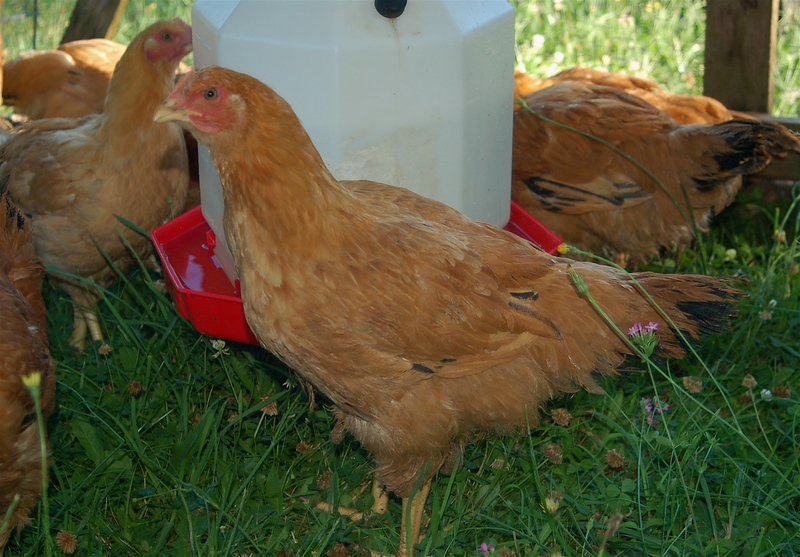 They are economical to keep and return a high percentage of food product for their size when compared to larger breeds. 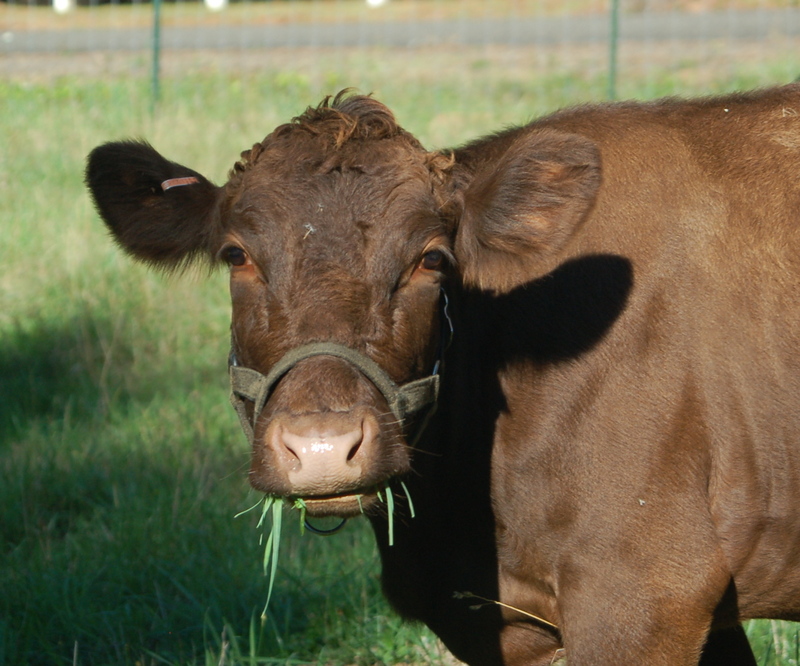 Dexters are the perfect breed choice for a small acreage family cow. Beautiful, gentle and friendly, easy to train and to handle. 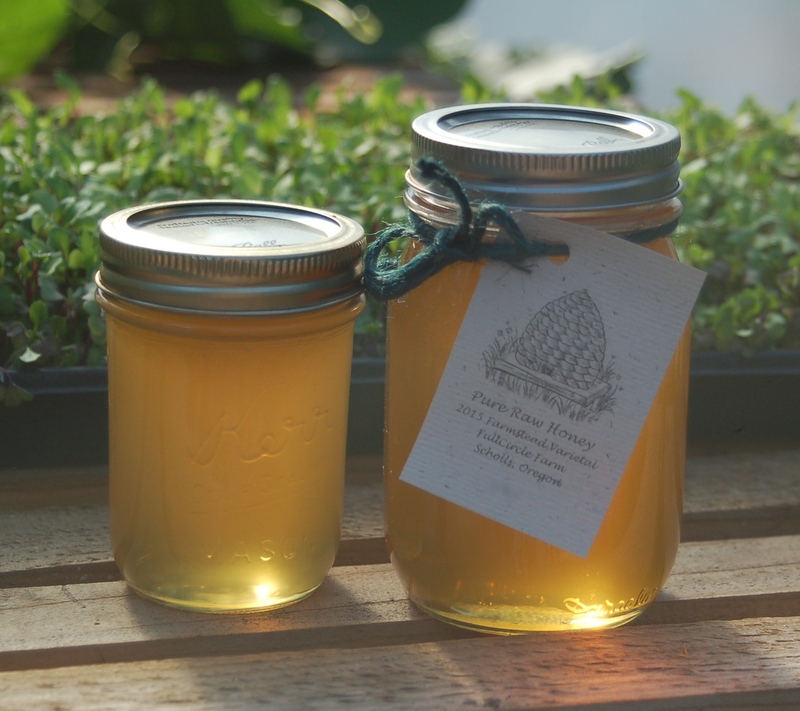 Their diminutive size makes them a great livestock project for children and a pleasure to work with for small women or older adults. 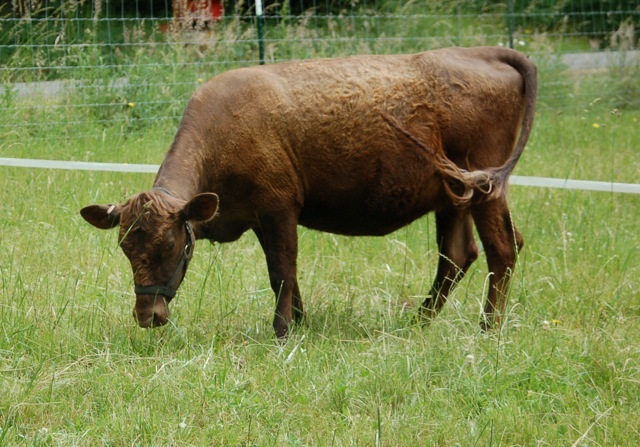 Dexter’s are hardy, long-lived and are known as great mothers and easy calvers. 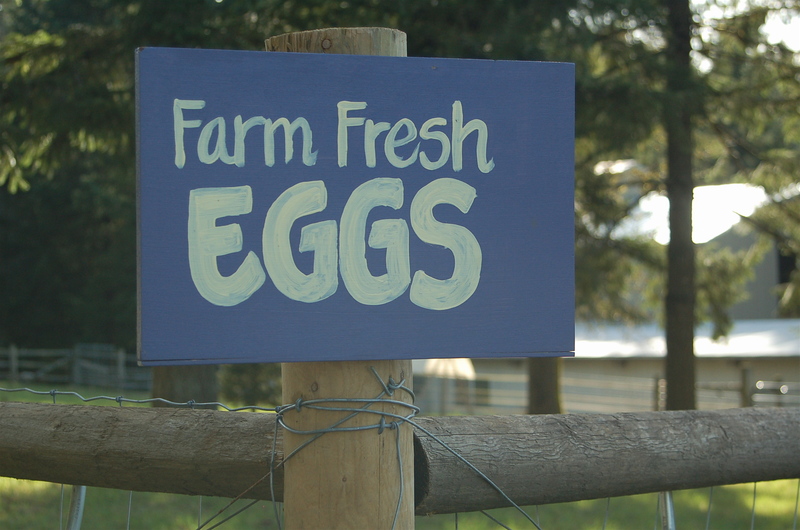 Our Dexter’s have been a wonderful addition to our farm. 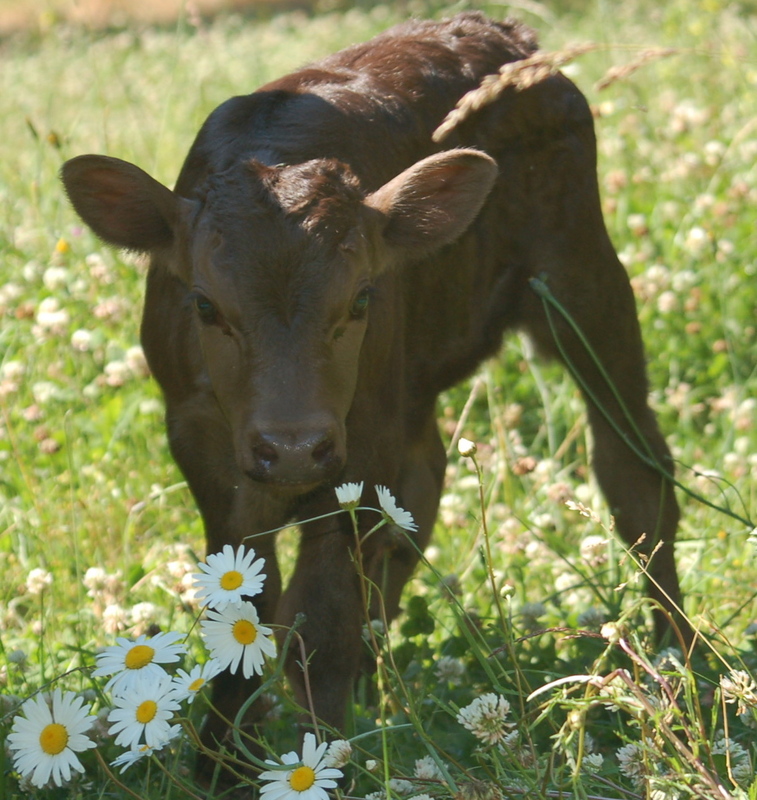 They are great fun and bring us immense pleasure as well as beautiful calves, wonderful dairy products and healthy beef. 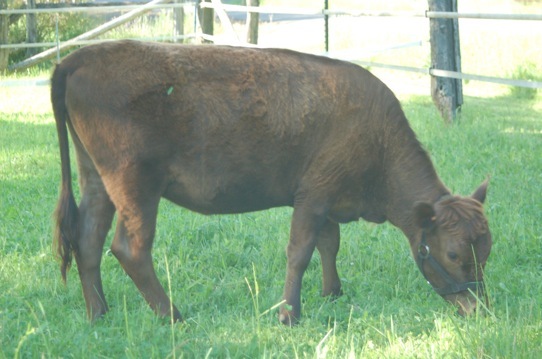 We occasionally offer for sale high quality registered breeding stock heifers. 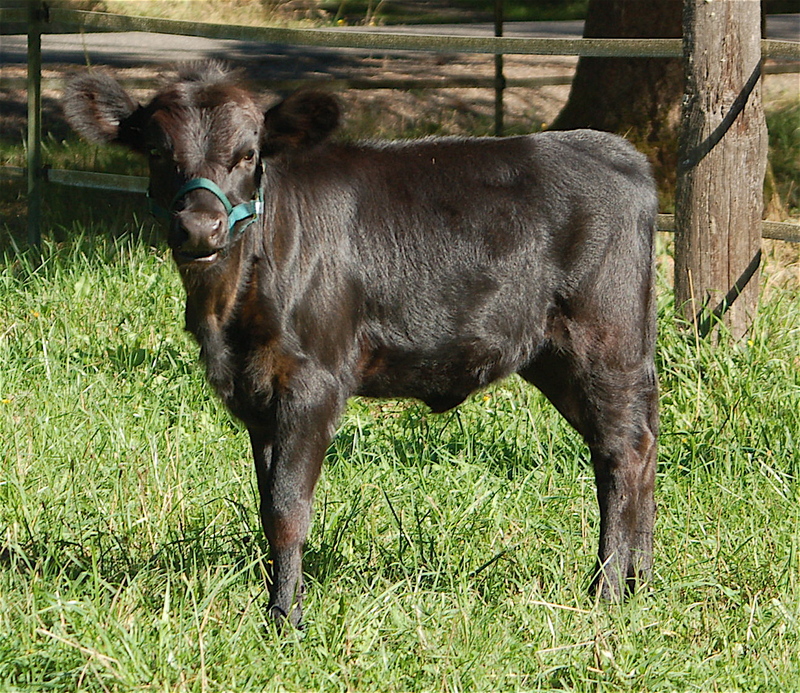 Please contact us at fullcirclefarmstead@frontier.com if you are interested in adding a FullCircle heifer to your farm! Belle Fourche ‘Mom & Grandma’ Merrideth the playground monitor. FullCircle Sophie @ 2 wks. FullCircle Maggie @ 1 day.